With a state that is so beautiful, it has been nicknamed “The Land of Enchantment,” how do you decide where to spend your next vacation? While the larger cities may offer plenty of opportunities for tourists, you can get a truly unique and authentic Southwest experience if you stay in one of the state’s smaller towns and villages. Chimayo, NM is one of these destinations and stands out among the rest for many reasons. Discover our beautiful and historic village and why it’s one of the best spots for a relaxing and memorable getaway. From stunning natural beauty to exciting attractions, there are a plethora of fun things to do during your New Mexico vacations. Request your free copy of our Chimayo Vacation Guide for a full list of our area’s most notable activities, dining, and New Mexico points of interest that you won’t want to miss. Founded in the 17th-century by Spanish settlers, the village of Chimayo, NM is a quaint and inviting Southwest village steeped in rich history. Many of the people who reside in Chimayo today are the descendants of the land’s original settlers. They continue to practice the traditions for which Chimayo became famous including blanket weaving, growing fruit orchards, producing red chile, and horse and sheep raising. However, Chimayo is most known for its religious pinnacle, the El Santuario de Chimayo. The Catholic church has been the site of many miraculous happenings in folklore, including the story of the disappearing crucifix almost 200 years ago. Each Good Friday weekend, the El Santuario de Chimayo is the final destination for a massive holy pilgrimage in which thousands of people gather at the church to worship and take some of the legendary Chimayo holy dirt for themselves. This soil is collected from a hole inside the church and is rumored to have miraculous healing abilities. In addition to the El Santuario de Chimayo, visitors to our village can enjoy a wide variety of other attractions in a peaceful and serene setting. The Chimayo Museum is dedicated to educating the public about the rich history of Chimayo through several collections, special events, and a community preservation association. The El Potrero Trading Post and Centinela Traditional Arts are local shops that offer unique products, goods, and souvenirs that you’ll want to bring home as gifts for your friends and family. If all of your adventures have worked up an appetite, head over to the famous Rancho de Chimayo for a delicious New Mexican meal rooted in ancestral influence. During your stay in Chimayo, we’re sure you’ll want to explore other amazing places in New Mexico. Luckily, our village is located near other fascinating locations that are well worth the visit, including the beautiful Santa Fe, New Mexico! As the capital of the “Land of Enchantment,” Santa Fe is a bustling city that has been consistently rated as one of America’s top destinations. During your visit, you can immerse in the city’s vibrant culture, admire the stunning architecture, get lost on the miles upon miles of hiking trails, or discover some of America’s most interesting museums. The world-renowned dining scene in New Mexico also offers something that even the pickiest of eaters will delight in. Whether you’re craving authentic Southwest cuisine or an unforgettable fine dining experience, there is a Santa Fe restaurant waiting just for you. No matter how you decide to spend your day in Santa Fe, you’ll be sure to make lasting memories that you’ll always cherish. 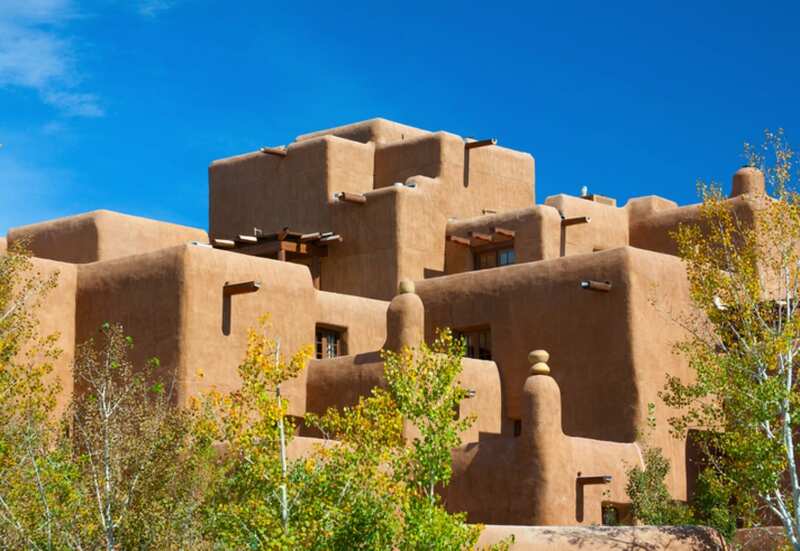 Taos, NM was discovered by Nomadic tribes thousands of years ago and was initially believed to be the fabled “City of Gold.” Although you won’t find walls of shimmering gold in this town, the abundance of natural beauty and things to do are considered Taos’ real treasures. The artsy town in New Mexico has inspired several great artists, including Georgia O’Keefe and Aldous Huxley. If you’re an outdoorsy person, Taos is also well-known for world-class skiing and incredible hiking trails. It’s a destination you won’t want to leave off your list! With a history dating back to 2,500 B.C., Jemez Springs is one of the most historic northern New Mexico towns. This land was originally inhabited by the Pueblo of Guisewa. Interestingly enough, many of the town’s residents are descendants of this ancient Indians. There are also many geological and cultural artifacts that still stand today, making it a must for history buffs! Located in the historic village of Chimayo, our unique bed & breakfast inn is unlike any other northern New Mexico accommodation. With traditional charm in a tranquil mountain setting, you’ll hardly find a better place to relax and experience the culture of the Southwest. Each of our guest rooms boasts New Mexican antiques and decor with all the modern luxuries you desire. Our guests will also be treated to a hot breakfast with a unique Southwest flair each morning. Whether you’re traveling to enjoy some quality time together or “just because,” you’ll want to take advantage of Casa Escondida’s exclusive vacation New Mexico vacations packages and specials. Book your next New Mexico getaway with us today! We look forward to seeing you soon.